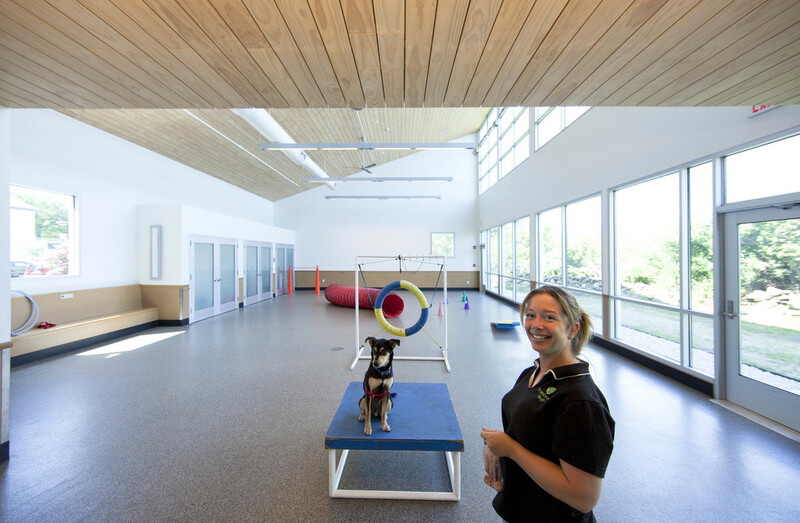 The design for the Potter League for Animals had to reconcile many competing challenges related to the unusual site and detailed program requirements. The site for the project is adjacent to a small airport on land owned by the Rhode Island Airport Corporation (RAIC) and leased by the owner. The new structure replaced an existing, single-story building of over 10,000 square feet (SF) built in the 1970s with a new structure of approximately 19,300 SF. Site constraints include Federal Aviation Administration (FAA) limitations on the building height and massing and Department of Environmental Management (DEM) wetland restrictions on the building location and footprint. 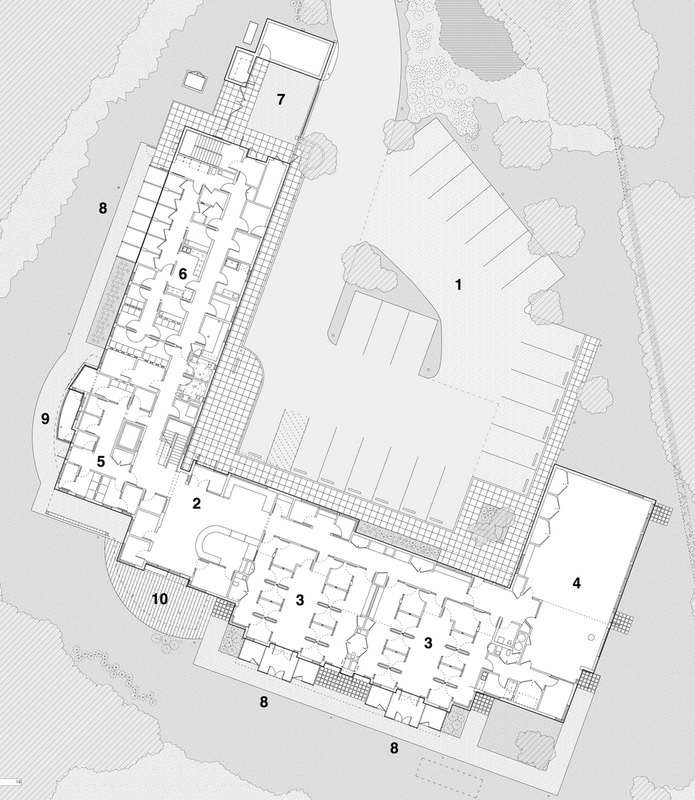 In order to accommodate the various programmatic requirements within the constrained development footprint, ARQ wrapped the new “U”-shaped building around the existing facility, allowing most of the existing building to be preserved during construction and keeping the footprint of the new building confined to the previously disturbed areas of the site and minimizing impacts to the surrounding wetlands. Features, like a 15,000 gallon cistern fed by reclaimed rainwater from the building roofs, vegetated and high-albedo roof surfaces, low-VOC and sustainable materials and high-performance glazing helped the Potter League earn LEED-NC Gold certification in August 2009, the first Gold rating for an animal shelter in the United States. 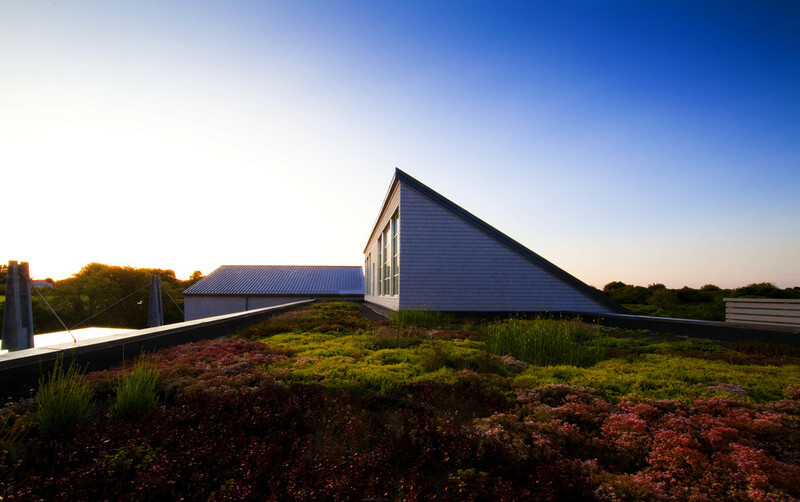 The images at left show site and building plans as well as highlighting some of the sustainable features such as the vegetated roof and rainwater recovery system. One photograph shows the roofline of the existing shelter building as the new building was constructed around it.